It’s been a busy couple of weeks. I haven’t spent much time at home in the evenings lately. That happens from time to time. Sometimes during the school year periods of time exist that require educators to be extra-present at school and/or in places connected to the work we do at school. We thrive on that presence. It propels our goals and helps us drive cultures of positive partnerships, learning and growth on behalf of the students we serve. At the same time that extra-presence occasionally keeps us at arms length from our families. It sometimes keeps us fighting for balance. I’ve become a decent scrapper in the fight for balance, far from perfect, but a decent scrapper. I would encourage anyone engaged in that fight to stand firm in it. As you know, balance is as important as any other thing when it comes to forward progress in all realms (if not more important). On good nights, lately, I’ve been arriving just in time to find the kids either brushing their teeth or settling into bed. Lorelei orchestrates the bedtime dance with what appears to be ease. Actually, it’s not easy. She’s become a more than decent scrapper in that fight. The other night when I approached the threshold of our home I noticed two huge eyes, seemingly fused to the inside side of the distorted glass of the door. It was as if a cartoon owl wearing bottle-thick reading glasses was waiting for me. It turned out that the eyes did not belong to a cartoon owl but rather to our four-year-old. I knew it even before I entered the house because the eyes were settled in at about thigh level, and also, I could make out his signature excited smile, warped through the glass though it was, it was unmistakably his. It rested a bit below the huge eyes and just underneath a smushed little nose. His as well. It was dark outside. It was cold. The glow from the windows and the door had me feeling as though I had walked out of a dark, cold wood toward a cozy cabin harboring a flickering fire. As I stepped up, close enough for the big-guy to see it was me, I heard what sounded like an uncontrollable, primal scream. He belted it out in unabashed enthusiasm. No words were needed. It felt good to be on the receiving end of that enthusiasm. I walked into a gigantic bear hug that almost knocked me over. Gigantic and extended. On and on he went. There weren’t breaks enough between the “and Daddy” expressions for me to respond. Responses were not needed. I soaked it in. I was exhausted, but this was it. This was why I did the rest of it. This was the reward. This was the prize. There I stood, one kid still hanging around my waist and one literally jumping for joy as he outlined moment after moment of his day, giving me a snapshot vision of how it unfolded, sharing his story with me, and connecting. We must remind ourselves of how important it is to be accessible to the kids we serve, those we serve as parents and those we serve as educators. We must remind ourselves because like balance and bedtime routines, as wonderful as it can be, we’ve got to fight for it. That kind of accessibility comes along with multiple challenges. It’s not always easy. At times we feel free. At times we’re organized and relaxed. Those are times when it’s easy and fun. At times we feel confined. At times we’re scattered and tense. Those are times when it’s not easy, and when it can even be frustrating (as silly as that sounds). Sometimes we do it well. Sometimes we sink into the energy and the words our kids so enthusiastically send our way. Sometimes we listen with wide eyes and deep appreciation. Sometimes we don’t do it well. Sometimes we struggle to shed the complex energy of each day and find our kids’ words muddling our thinking and frustrating our restoration. Sometimes we struggle to listen, struggle to hear, and struggle to appreciate. It breaks my heart to think about. Wouldn’t it be great if we could be the parents and educators we would describe ourselves as in every moment? Wouldn’t it we wonderful to be able to give our kids all they need in all the moments we spend with them? Maybe we do. Maybe we do it in ways we don’t fully understand, even during the times during which we’re questioning ourselves. 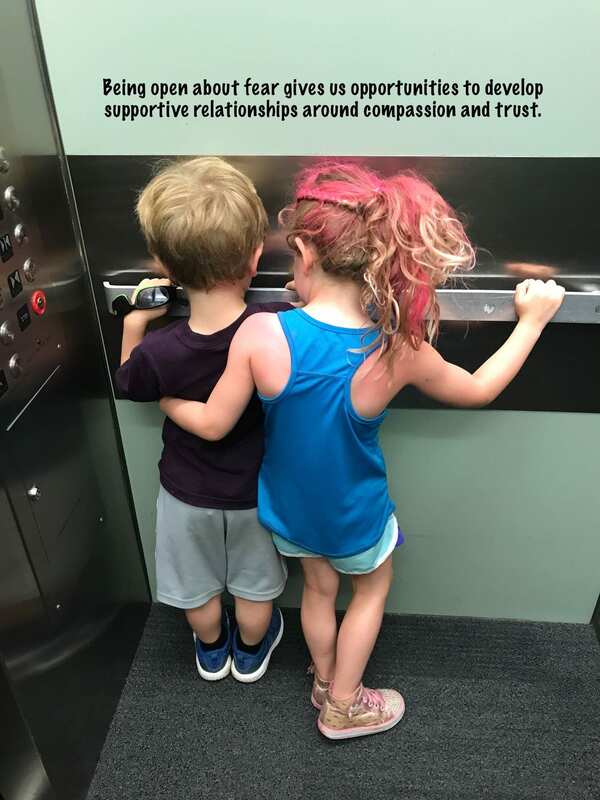 Maybe along with accessibility our kids need to see us struggling, failing, and climbing our way back, even, and maybe especially when that climb is a rough one. If that is the case, we might also consider showing them how we forgive ourselves. If it’s not me might consider it anyway. While I continue trying to catch, receive, and savor every “and Daddy” that comes my way I plan to also continue remembering that I’m human, and that sharing my whole self with the kids I serve, in ways they can understand and learn from, in genuine and caring ways, and in ways lined with hope and optimism, seems like the right thing for me to do. As you think about how you serve the kids you serve what will you continue trying to do, in what ways, and why? 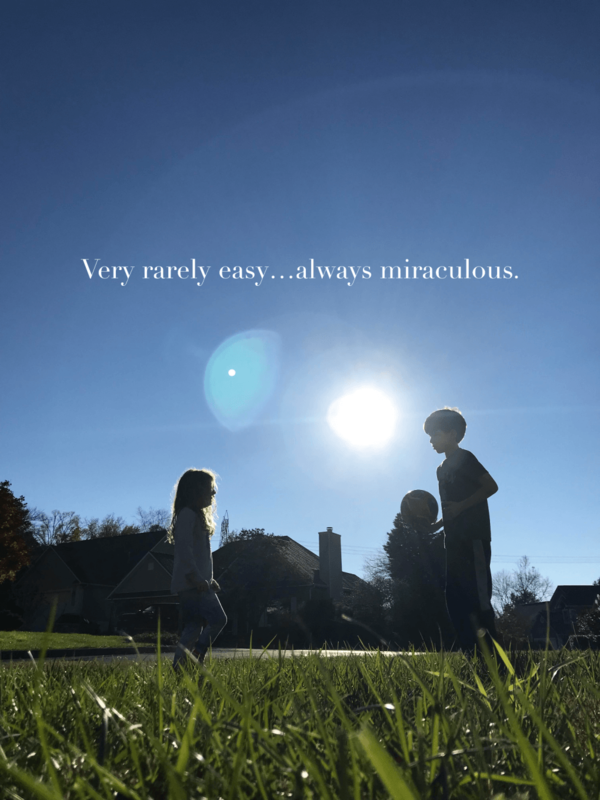 I’m finding that raising kids is very rarely easy but that it’s always miraculous. We were at my nephew’s 16th birthday party. He’s a great kid and our kids love him to pieces. Essentially, he becomes a jungle gym when we get them together. This time, however, he was surrounded by his friends. The party was teaming with enthusiastic 16-year-olds chattering away about whatever it is 16-year-olds chatter away about and patting my nephew on the back. My kids had trouble making their way into that mix, so they were eventually left to their own imaginations and resourcefulness. They decided that chasing one another around, finding hiding places and testing the limits of mischievousness would be a perfect direction to in for the afternoon. That’s when it happened. The 3-year-old called a staff meeting. He literally shouted, “Staff Meeting! Staff Meeting!” The others eventually gathered under the pergola-like structure on the side of the house and waited for further instructions. I witnessed the phenomenon from a distance and smiled. I didn’t get involved at first. Eventually, as the staff meetings increased in frequency the others lost interest. Sure enough, the 3-three-year old found his calls futile. “Staff meeting! Staff Meeting!” He continued. His bothers and sister stopped attending or even responding. They moved on and back to the “limits of mischievousness” exploration. I couldn’t leave the big guy thinking his staff meetings weren’t important. He was working so hard to organize them and he seemed to enjoy the so much. Besides, being someone who facilitates staff meetings myself I thought I might be able to learn a thing or two. Couldn’t hurt. She I answered the call. He smiled and directed me to the spot under the pergola-like structure. Before I could answer he listed the options, “You can be the ninja who runs around, the ninja who flies, or the ninja who annoys people.” I decided to be the ninja who annoys people. Why fight it. He told me that he would continue to be, “The adorable ninja,” and off we went to skillfully annoy people and be adorable with stealth and cunning. It was a blast! 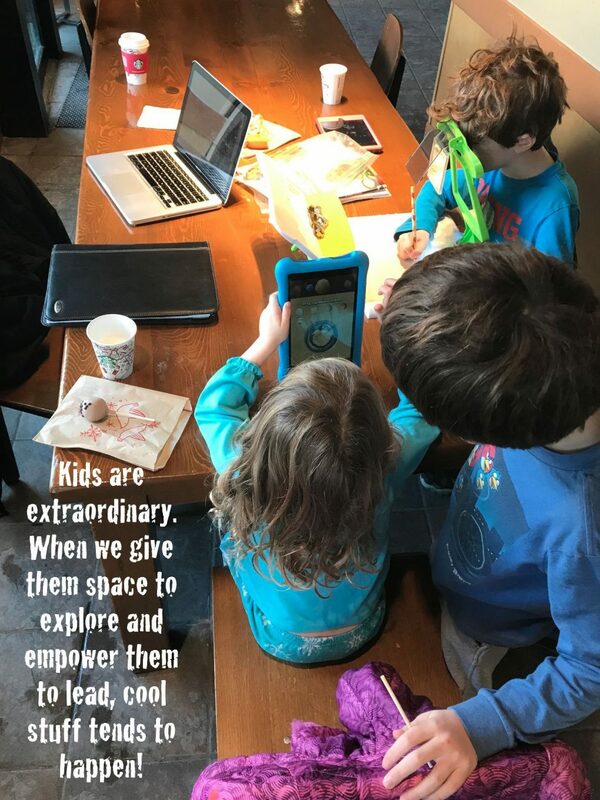 As parents and educators we simply must take the time to engage in the strange, wonderful, creative, and unique imaginative play scenarios the kids we serve come up with. They need to know how important we find things that are important to them. They need to know that we appreciate, cherish, and want to enthusiastically engage in the world as they see it. They want to see that pretending is a wonderful pathway to discovery and innovation. 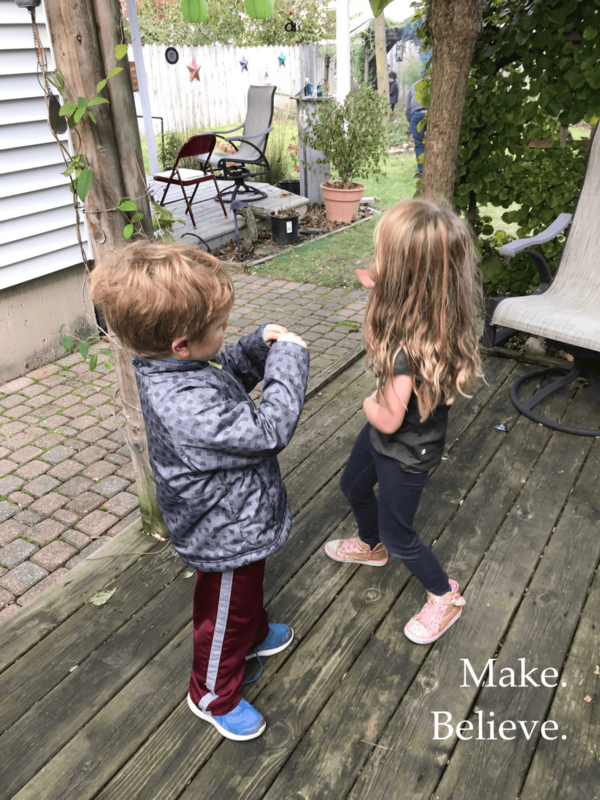 While we teach them the ins and outs of navigating real-world challenges, we’ve got to let ourselves holistically fall into the world of kid play that serves as such a wonderful foundation for their learning, growth, individualized development. This kid says lots of interesting things. I get it, he’s spent much of this life observing three older siblings, a mom and a dad, and the world around him, quietly, patiently, and with a curious, reflective look on his face. Each of our kids have just under a two year gap between them and the next, so they seem to relate on many levels. They play together well. They argue, fuss, and fight well. They share solid and deep love and a bunch of joyful moments with one another. Well. This one, though, is just young enough that he does a bit more watching than the others. The others are usually entangled. He’s in the mix much of the time, but sometimes he’s not. My wife and I speculate that “out of the mix” watching has given him a unique perspective on things. We speculate further that it could be at least a part of the foundation of his fascinating, uniquely articulate ways. 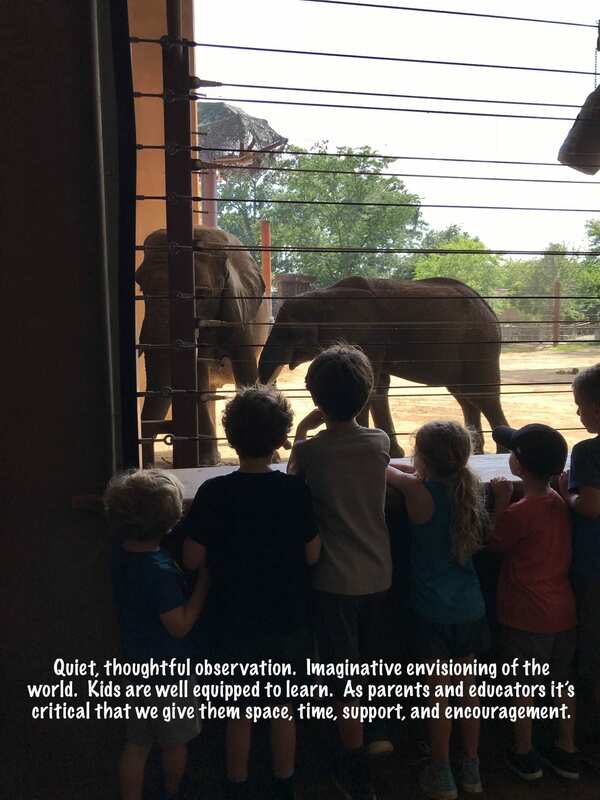 Quiet, thoughtful observation might just lead to joyful learning and growth. Who knew? He says it when he’s looking to dig deeper. It’s an exploration catalyst. You get it. He utters this signature phrase and comes running to question, explore, examine, celebrate, and marvel in the wonders of the world as they unfold before and around him. It’s build in. It seems to be built in to all of them. The 9-year-old is an explorer as well. He’s an explorer of the world in a bit of a different way. His explorations fold almost seamlessly into his imagination. Sometimes he seems lost in thought. I’ll ask how he’s doing. He’ll tell me he’s fine, and that he’s imagining that dinosaurs exist. It’s fun for me to see him lost in the world of his imagination. I’m a dreamer, too. I was at his curriculum night this week. Each kid posted a display of places they had been during the summer. They labeled sticky notes with a location and drew landscapes on a grid under the sticky notes. Each sticky note could be lifted up to reveal the landscape. There were about ten spaces in the grid. Most of his were current, existing places. He listed Mackinac Island, Kalahrai, The Adventure Park, The Sleeping Bear Dunes, etc. Then, I came across the sticky note that read, “Pangea.” I lifted it. Dinosaurs. He drew and colored a likeness of his exploration of a place in which dinosaurs exist. He did so as a representation of a place he’d visited this summer. Dreamer. Imaginative envisioning of the world might just lead to joyful learning and growth. Who knew? Quiet, thoughtful observation. Imaginative envisioning of the world. Kids are well equipped to learn. As parents and educators it’s critical that we give them space, time, support, and encouragement. They are each unique. It’s critically important that we celebrate that uniqueness. It’s critically important that we get to know them well, and that we facilitate a process by which they can safely explore and be proud the pathways they envision for themselves, which are sometimes not exactly the ones we envision for them. It’s critically important. When I met the 9-year-old’s teacher this week she greeted me with her arms tucked in and her hands wiggling around. She told me she was practicing her T-Rex arms so that she could communicate with my kid. She only just met him. I almost cried. He is going to spend this school year learning and growing with a teacher who’s genuinely interested in knowing him and supporting his unique pathway. He’s spending his days with a person who’s excited that he’s a dreamer. She seems like one, too. My heart is filled with gratitude. After one week we are reminded in no uncertain terms that educating children is a fast-paced, challenging, and often stressful charge. However, even in our exhaustion we are also reminded in no uncertain terms that it’s infinitely joyful and unimaginably rewarding as well. Let’s find the balance. Let’s go with the flow. Let’s always remember the joy. Let’s rely on one another to accept every challenge as a chance on behalf of our students we serve. We visited lake Huron this past weekend. It was a really cool place on Michigan’s east coast called Sturgeon Point. There’s a one room school house, a lighthouse, and an awesome, rocky beach. 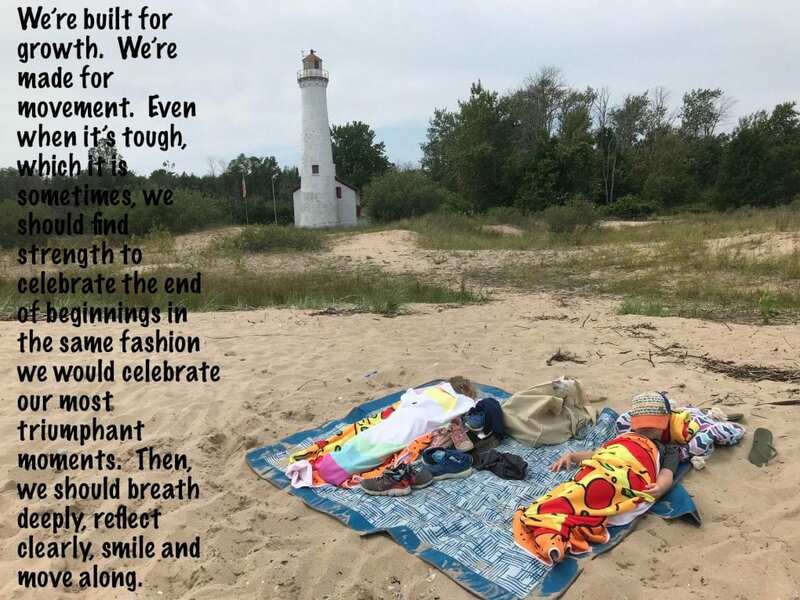 We’ve been all over the mitten this summer. Sturgeon Point is quite different from the more tourist-populated, built-up destinations we spent most of our time at on the west side of the state. That said it was among my favorites. The rocks were smooth and colorful. Many fossils for the kids to discover and collect. The wind was blowing perfectly. Not to hard but steady enough for each blade of dune grass to stand a bit slanted and wiggling in unison with each of the others. The waves capped off in white foam as they crawled toward the shoreline. The kids’ kites lifted up out of their hands to dance above us with such little effort. On that day, and in those moments, they were all world class kite pilots; youngest to oldest. The cheap wood and plastic apparatuses were dipping, weaving, diving and soaring at their will. Our three dollar kites would have thrilled even the Wright Brothers with their grace and utility. I was in the waves. It’s one of my favorite places to be. A Michigan kid all the way. The water was warm so a few of the others took the plunge with me, body surfing and horsing around a bit. He smiled and said, “Maybe another time,” before dutifully returning to his task. Ouch. Maybe another time. Ok. I had no option but to grab the seven-year-old from a few yards away toss him back in the water. Unlike his big brother, he had to. I wondered about the line. When does a kid change from someone who appreciates being forcibly (and lovingly) tossed into the lake to someone who doesn’t. Different for each I suppose. Regardless, in that moment it struck me that this kid could be experiencing the end of a beginning. He’s certainly not done being a kid. He’s not at the end of the end of it. I hope he’s not at the end of the middle of it, or even the middle of the middle. Just maybe at the end of the beginning. For a moment I had succumb to a whirlwind of reflective thinking about this seemingly horrible prospect. If this ridiculous thing is happening to the nine-year-old what might be happening to his siblings? Earlier in the day I told the three-year-old that we were going to go on a glass bottom boat, only to be confronted with, “Is it a secure glass bottom boat?” Three-year-olds don’t ask that. Is he at the end of the beginning of tiny tot-ness? The seven-year-old is stretching out. There’s no more meat on his bones at all. Where did it go? All of his pajama bottoms are floods. I could swear they fit him last weekend. Is he at the end of the beginning of little kidish-ness. The five-year-old doesn’t give me a hug and kiss anymore when I drop her off to play with friends. Instead, she extends her tiny hand and insist, “Just go, Daddy!” Doesn’t even look back. I know because I do. A lot. What beginning could she she be at the end of? I don’t know what kind of fortitude I’m supposed to have, but thinking about all these ends of beginnings was really starting to get tough on me. The previously enjoyable waves of Sturgeon Point, once calmly lapping at our beautiful rocky lighthouse shore had transformed into pulsating waves of mocking, taunting laughter that almost had me holding on for dear life. “Time waits for no man!” They laughed. “Your grip is slipping!” They provoked. Until it hit me. Things came a into focus and I quickly settle back into the great joy of my lot. I’m a husband, a parent, and an educator. It’s not for me to want for stillness, but rather revel in the movement that drives all I’m supposed to be doing. I’m supposed to appreciate growth. I’m supposed to look on independence with gratitude and find the courage to step ever-back as they move ever-forward and even away. I’m supposed to find the strength to continue showering those I love with that love while I loosen my grip on their hands. There are ends to my beginnings too. Good ones. Headed into my fifth year as the principal of a warm and welcoming school community in a progressive, cohesive district I feel that a beginning may be at its end for me. To be clear, I have light years to go in my capacity for service and in my leadership practice. It’s just that I know a bit more than I did before. I have a bit more skill on the foundation of a few more mistakes I’ve been gifted to make in the bit more time I’ve had to practice my job, craft, my art. As we think about moving into another energized and exciting school year I say we consider intentionally relishing the end of beginnings as it comes to us, to each other, and to the kids we serve. We’re built for growth. We’re made for movement. Even when it’s tough, which it is sometimes, we should find strength to celebrate the end of beginnings in the same fashion we would celebrate our most triumphant moments. Then, we should breath deeply, reflect clearly, smile and move along. Cherished memories in our minds and our hearts and the conviction that our collective learning will guide us ever-closer to wherever it is we’re going…we should smile and move along. The Doing…Possibly Even Better Than The Done! People periodically ask me when I’ll be done with my PhD. I suppose it’s a reasonable question. Even so, I have no answer. I’m relatively confident that there’s a chance I might defend my dissertation sometime in the vicinity of between two and twenty two years from now. It’s a really difficult thing to pin down at this point. Are you ready for a bit of what might seem like complaining? I wake up really early in the morning. I’m no spring chicken, so I have to swim for a bit before I go to work. It get’s my blood flowing and makes me able to move in the ways I think I was intended to be able to move. Specifically in the ways I’m not able to do when I roll out of bed. Ever pull a muscle adjusting a pillow? No spring chicken. After swimming I head to work. I have a wonderful job. I really can’t imagine a more joyful way to spend my workdays than doing the things I’m charged with doing as an elementary school principal. Sure, some of it’s more fun and some of it’s less fun, but whose job doesn’t have ups and downs, challenges and triumphs? Actually, some of the more challenging moments end up being some of the ones that offer some of the best growth opportunities. Regardless, there’s lot’s going on. Occasionally, even the most well-planned days slip away without the well-planned plans unfolding, and when I say occasionally what I mean is frequently. Lots of meaningful and productive things typically happen, just sometime not the things I intended. After work I either continue to work until I no longer can, or I do something like take my kids to swim lessons, piano, soccer, pillow polo, etc. 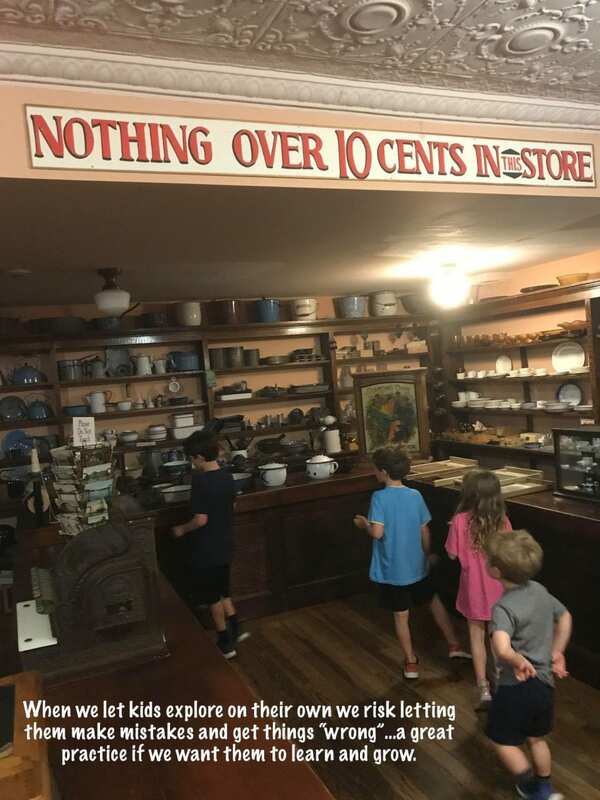 To be clear, my wife is usually in on the taking of kids to places. Sometimes, if my wife has a meeting or some other commitment in the evening I head home to play with, feed, bath, read to, and put the kids to bed. Our kids are 8, 6, 4, and 3 years old. Evening routines are wonderfully loud and energized with lots of wonderful noise and remarkable motion. Tiring. Did I mention I’m no spring chicken? Weekends are half work and half play unless certain ones require more of either. Again, I know the previous couple of paragraphs might sound like a complaining rant. Thank you for your tolerance. The truth is I have no complaints. I sincerely enjoy all of that stuff. I’m a very lucky guy, blessed in so many ways. The point is not that I have too much to do. Don’t we all? The point is that I very infrequently find myself done with much of anything. I imagine it’s that way for many of us. Parents and educators are constantly running, pouring everything we have into every moment, getting it “right” occasionally and getting it “wrong” a good bit too, feeling exhausted much of the time, pushing through, caring deeply, moving quickly, and regularly being told (by others and by ourselves) that we’re off the mark in one way or another. Good news, I found a solution! It’s not an easy one to implement, but those often turn out to be the best ones, with the most meaningful outcomes. Here it is: appreciate, celebrate, and focus on the doing rather than the done. After all, are we really ever “done” with anything? Should we be? Done is darn final. Done is kind of bleak. I officially have no clue about when I’ll be done with my PhD. No clue. Officially. Zero. Zip. Zilch. Nada. However, I’m quite certain that when I am done I won’t be doing it anymore, and doing it is really meaningful. Maybe I should intentionally never be done (my dissertation chair probably got heart burn just as I wrote that. Sorry). Friends, I assure you, I’m doing the best I can, which includes learning and doing better each day, and I still simply ain’t getting it all done. So, in an effort to honor my well-being I’m going all in on this “doing” thing. I’m going to appreciate and celebrate “the doing” and see how that goes. Actually, I’m doing it right this moment and it feels good, which is good. When we feel food we’re better for ourselves and for those we serve. The doing. It’s good, and it’s a really easy thing to focus on. After all, you’re doing it anyway. I was walking to the library with the kids. Lorelei was out, so it was just the five of us. It was a cold but sunny day. A fusion of snow and ice covered the ground with some glazed over, shiny grass peeking through. Our eight-year-old led the way. They marched like the seven dwarfs, jolly hopping and jumping intermittently interrupted by some bumping and pushing. Laughing and talking mixed with whining, crying, and shouting. 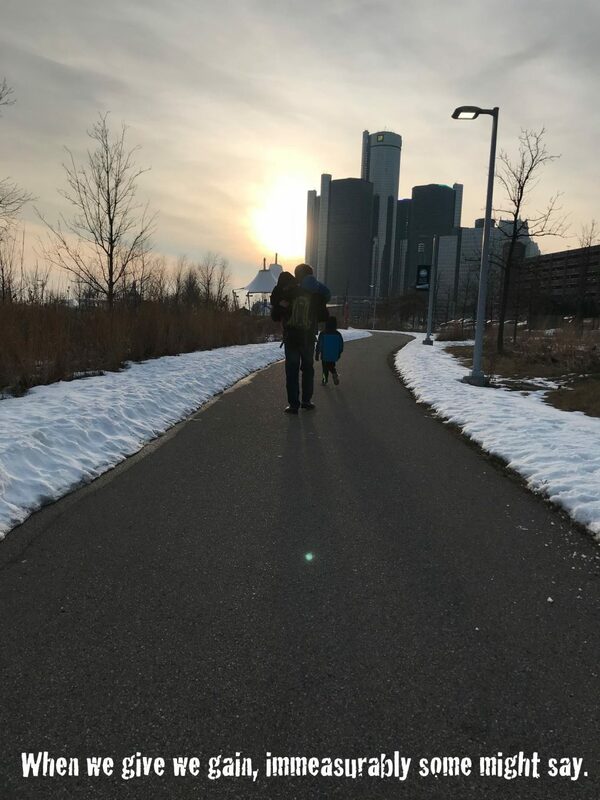 It was a heck of a day for a walk and we were all enjoying getting out of the house after several bitterly cold days in a row. Instead of going inside when we arrived, the crew set up shop outside the library in the frozen garden area where they had many sticks to crack ice with, some sculptures to climb on, a couple of snow banks to kick, a tree to push, and some rocks to smash and throw. They found a painted rock. They took turns suggesting places to hide it, just within view of the next passers-by, so that they could find it too. Kids have an amazing capacity for finding joy in just about anything. 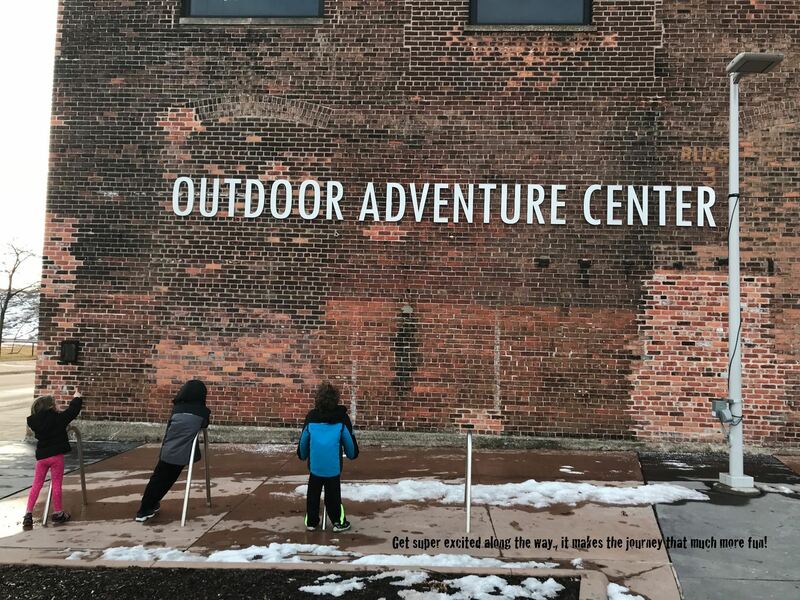 If you can find joy in smashing rocks, kicking snow banks, pushing on trees, and climbing on sculptures you should never be bored. I pretty sure that’s a law of physics. Anyway, our oldest got an idea. I knew it popped suddenly into his head with extreme force because his eye widened, his body shook, and he bounced around as if he was riding on Tigger’s tail. “We could do a show!” He cried out. He was elated! The little ones agreed. He immediately set in describing the first episode. Each episode would be a mix of funny and educational. They would go on adventures and teach about facts. In this episode they would dig into ice for rocks. He would check out some library books about ice and rocks for the educational parts. They would get silly for the funny parts. I pulled out my phone, showed him how to open iMovie, gave him a few basic tips, and about four hours later episode one was born, complete with music and titles. Funny and educational. It’s a great show! I can’t wait for episode two. He tells me it’s going to be about flowers. 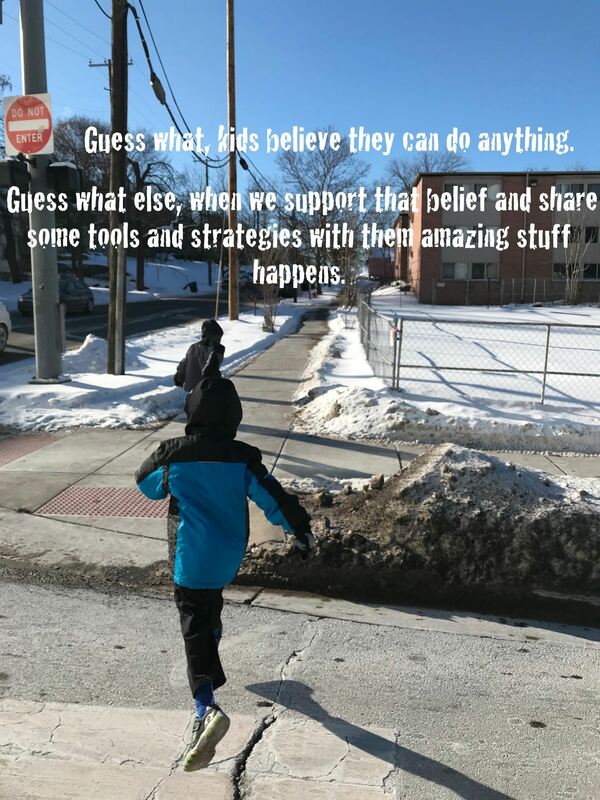 Guess what, kids believe they can do anything. Guess what else, when we support that belief and share some tools and strategies with them amazing stuff happens. A good question for parents and educators to consider as we support the kids we serve in exploring their world.